quickly to his new home. Tiger is a very affectionate cat although he likes to sit beside you rather than on your lap. He is also a very vocal cat and loves to talk all the time...he is especially vocal when he knows he is getting a treat like tuna! Tiger likes to play in boxes, sit at the patio door watching the birds, sleep on the couch & play with his brother Smokey. 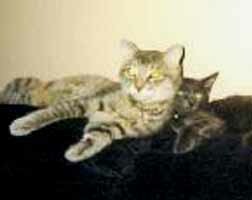 (We got Smokey later on so Tiger could have a friend/playmate). They get along great! I have also included a picture of both of them. Thanks so much for giving us the pleasure of having such a wonderful cat like Tiger! We love him a lot! 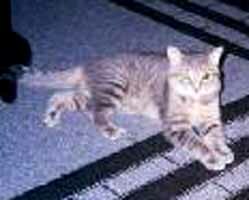 We would recommend Animal Welfare to anyone looking for a cat. What you do is really great. The animals are really lucky to have people like you to help them.